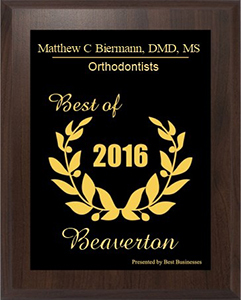 Matthew C Biermann, DMD, MS has been selected for the 2016 Beaverton Small Business Excellence Award in the Orthodontists classification by the Beaverton Small Business Excellence Award Program. Various sources of information were gathered and analyzed to choose the winners in each category. The 2016 Beaverton Small Business Excellence Award Program focuses on quality, not quantity. Winners are determined based on the information gathered both internally by the Beaverton Small Business Excellence Award Program and data provided by third parties. The Beaverton Small Business Excellence Awards recognizes outstanding small businesses that serve the Beaverton area. Each year, our selection committee identifies businesses that we believe have achieved outstanding marketing success in their local community and business classification. Recognition is given to those companies that have shown the ability to use their best practices and implemented programs to generate competitive advantages and long-term value. These are small businesses that enhance the positive image of small business through service to their customers and our community. These exceptional companies help make the Beaverton area a vibrant and vital place to live. The Beaverton Small Business Excellence Awards was established to reward the best of small businesses in Beaverton. Our organization works exclusively with local business owners, trade groups, professional associations and other business advertising and marketing groups. Our mission is to award the small business community’s contributions to the U.S. economy. At an age when image is so important, for a teen the thought of having metal brackets and wires constantly attached to teeth may exacerbate the already-delicate self-esteem of today’s teens. While having straight teeth and a beautiful smile is important to teens, the “Behind the Smile” survey revealed that over half of teens (54%) believe metal braces would make them more self-conscious, and one in two teens (50%) would smile less. Fewer office visits – a huge advantage for busy households! 81% of moms choose Invisalign when considering how braces might impact the self esteem of their teenager. Contact Biermann Orthodontics today for a free Invisalign Consulatation! I want to have some missing teeth replaced with dental implants, but my dentist said it could be slightly risky because I smoke. Why? I just had my braces removed, and I noticed several white spots on my teeth near where the brackets were. What are they — and how can I get rid of them? Imagine a world without antibiotics: The cut on your finger might lead to serious infection; the simplest operation could be a perilous undertaking; there would be no effective cures for tuberculosis, cholera, strep throat or sexually transmitted disease; and bacterial meningitis in a child would likely be fatal. It may seem hard to believe, but a century ago — before antibiotic drugs became widely available — these risks were very real. These omnipresent drugs have been hailed as one of the most significant medical achievements of the 20th Century. However, in recent years, a disturbing trend has been noted throughout the world: The life-saving drugs we once relied on are now less effective at fighting the organisms that cause disease. Replacing a missing tooth — particularly in a highly visible area of the mouth — can do a lot to restore your smile and self-confidence. Today’s options for tooth replacement include state-of-the-art dental implants; crown and bridgework; and removable partial dentures. However, sometimes orthodontic treatment is recommended before a tooth or teeth can be replaced. Why would this be necessary? If a tooth has been missing for a while, the teeth that were on either side of it can gradually drift into the space it occupied — taking up the room for the replacement tooth. This necessitates moving the neighboring teeth back into correct position. In addition, teeth that are not properly aligned might require dental restorative work, such as capping (dental crowns), to camouflage their poor position or orientation before any new teeth are placed. My 10-year-old sucked his thumb from birth until age 8. I’m wondering if this habit affected his bite because now his teeth don’t come together in the front and every time he swallows, his tongue moves forward. What can be done? I am a fifty-five year old woman, and I’ve been suffering from TMJD pain for many years. I also have arthritis, chronic fatigue and headaches. Are these conditions related, and what would help? Many people who suffer from temporomandibular joint disorders (TMJD) do indeed find that they have other health problems of the type you describe. Let me sum up for you what we know about TMJD, what has proven helpful in treating it, and how it relates to other painful conditions. TMJD refers to a group of ill-defined, painful, even debilitating disorders that affect the jaw joints, muscles and other surrounding tissues. Some people use the acronym TMJ to refer to the disorder, but TMJ is actually the abbreviation for the temporomandibular (jaw) joint itself. Health care professionals prefer to use TMD or TMJD. Whatever names it goes by, the common thread is pain or limited function in and around the jaw. There also may be popping, clicking or grating sounds when the jaws open or close, but this is not cause for concern unless accompanied by pain or limited jaw movement. I have a gap between my two front teeth. My dentist says my teeth are separated because of a muscle that runs down between them. I want to have the spaces closed but he says I will need surgery. Please explain further!